A catering operation spares you certain spirit-crushing realities (e.g., a regular trickle of complaining customers), but also denies you certain spirit-lifting perks (e.g., constantly guzzling your own fountain drinks). Now diving into the resto game, Blue Ribbon BBQ. The offshoot of a massive-scale Taylor, TX catering operation established in 1945, Ribbon's headed by a 3rd-generation meat-monger who's ready to stuff Austin inside a white-walled cafeteria-style beef depot that pays homage to the Southwest's saucy legacy by adorning its walls with black & white photos of bygone bbq all-stars (John Stockyard! Scottie Pig'in!). 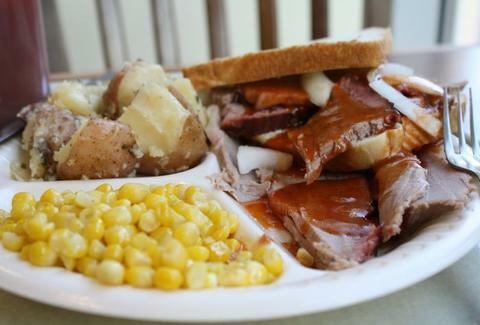 The oak-smoked meat is delivered daily from Taylor, with particular points of pride being the 10-hour brisket, pulled pork with a secret family rub instead of the usual sugar/molasses, and the house-made beef/pork combo sausage, in addition to turkey, chicken, and pork ribs, which have a voodoo-like ability to cause your own to magically vanish. If it's a spud web you weave, they're baking giant potatoes smothered in butter, cheese, sour cream, and bacon, plus primo toppings like chopped beef/chicken breast, pulled pork, or the delicious meat of turkeys, which Clipse use to open the Thanksgiving doors. The downtown opening doesn't signal a total shift however: despite their crippling lack of a soda fountain, the Taylor catering business will continue to deliver smoked goodness, all over the Big Red, White and Blue.